← Matzo, For The Last Time! In the middle of making (or trying to make) arepas for the first time, I realized that plain corn meal is not the same thing as masarepa (arepa flour). Not at all. I had never tasted or even seen an arepa before, and my idea of what exactly they were was fuzzy at best, but I could clearly tell that what I was making was not an arepa. Masarepa and corn meal are about as much alike as bread crumbs and flour; both are made from the same basic stuff, but the latter is milled raw, while the former is cooked, then milled. As you can imagine, the two do not act at all similarly in a dough. After I managed to track down some proper masarepa, I was able to see for myself exactly how massive the difference was. Corn meal, when mixed with liquid, kinda just sits there, never fully absorbing the moisture. Masarepa, on the other hand, quickly absorbs liquid, turning into a dough with an almost putty-like consistency. You are then able to easily form it into the traditional English-muffin-shape, something regular corn meal could never do. While mixing the arepa dough, I was struck with the way it smelled: it smelled exactly like the Quaker instant grits I grew up on. Considering the similarities in basic composition (ground cooked corn), I’m sure that’s no coincidence. All that aside, real arepas are really tasty, you guys! Rarely, if ever, eaten plain, the humble things bring a gentle corn sweetness to whatever you might fill them with. You could describe them as very dense hamburger buns made of corn; but that does no justice to the soft and moist interior, or to the golden and enticingly crisp exterior, or to the slightly petite size that only helps make it dangerously easy to reach for another, as filling as they are. Though masarepa (like all corn flours) comes in both white and yellow, you’ll find strict devotees to one color or the other, arguing fiercely that theirs is the only correct option. As far as I’m concerned, the two varieties taste nearly identical; use whatever kind you prefer (or can find). I used white here simply because I thought it would look pretty. As far as filling goes, the sky’s the limit; I made some black-eyed pea burgers to help use up a giant pot of leftovers. More traditional fillings would be items like cheese, vegetables, jam, eggs, pork, beef, or chicken. A famous combination called La Reina Pepiada involves chicken, avocado, and mayonnaise (much like chicken salad), and sounds absolutely mouth-watering. Whatever filling you choose, though, it should be heavily seasoned or spiced, as the relative blandness of the arepa will balance it beautifully, much like a tortilla does with, say, a very spicy pulled pork. So in the event that you ever run across a bag of masarepa in your local supermercado, you may want to throw it in your cart. 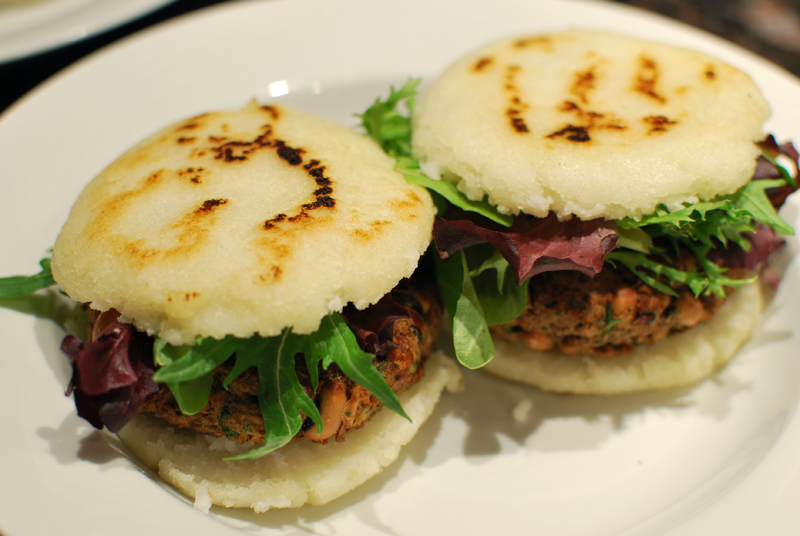 As easy, fast, and delicious as real arepas are, you absolutely won’t regret it. 1. Preheat the oven to 350º F. Lightly grease a large baking sheet, or line with parchment paper. 2. In a medium bowl, stir together the masarepa and salt. Add 2 1/2 cups water, and stir until incorporated and all dry spots are moistened. Check the consistency by rolling a bit of dough into a ball. If it is too wet and sticks to your fingers, add more flour; if it is too dry to hold together in a ball without cracking, add more water. Cover with plastic wrap and let stand for about 10 minutes; the dough will stiffen in this time. 3. With moistened hands, form about 1/4 cup of dough into a ball, rolling between your palms and gently pressing to form a disc about 3 inches wide and 1/4 inch thick. Gently press around the side with a wet finger to eliminate any cracks. Transfer to the prepared baking sheet. Repeat the shaping with the remaining dough. 4. Heat about 1 tablespoon oil in a large nonstick or cast iron skillet over medium-high heat until hot, but not smoking. Brown arepas in batches of 2 or 3, or as many as will fit in the pan without crowding. Flip once, and cook until each side is deeply golden, about 5 minutes per side. Place again on the baking sheet after browning. 5. When all the arepas have been browned, transfer the baking sheet to the oven. Bake at 350º F for 15 to 20 minutes, or until they sound lightly hollow when tapped. Serve immediately. 1. If any dough is left over wrap it in plastic – to keep in the moisture – and place in fridge. It will keep for three to four days. 2. Masarepa may be found in Mexican or Latino markets. Goya or Harina PAN are well-regarded brands. 3 Responses to Arepas, For The Last Time! yum!!! try adding a little butter and shredded white cheese to the dough, it makes them delicious!